Home Fraser Coast Sunshine Coast Malaysia airlines Log your bookings here! Play the quiz! Australia’s Nature Coast is your naturally abundant destination for sparkling azure waters, National Parks, bush walking and hiking, fishing charters, food trails, horse riding, markets, snorkelling and diving, tours and cruises, watersports and whale watching. Spanning Queensland’s Sunshine and Fraser Coasts, Australia’s Nature Coast offers unbeatable natural experiences in some of the world’s most diverse and pristine National Parks, rainforests and waterways. From the Sunshine Coast Hinterland with the Glass House Mountains just north of Brisbane through to Noosa with its renowned National Park, beaches and dining scene, winding around the coloured sands of Rainbow Beach, the unrivalled whale watching and aquatic playground of Hervey Bay and the Great Sandy Strait along with iconic K’gari - Fraser Island - you’ll fall in love with some of the most beautiful places to visit in Australia. Fancy discovering Australia’s Nature Coast for yourself? We’re offering 7 agents the chance to join an exclusive fam trip to Australia’s Nature Coast to discover what this naturally abundant corner of Queensland has to offer. To be in with the chance of winning a place, simply sign up and complete the quiz. Then, to boost your chances of winning - log your Australia’s Nature Coast bookings to get more points! The fam trip is taking place 19 May – 28 May 2019 – block it out in your diaries now! You’ll arrive courtesy of Malaysia Airlines into Brisbane, and then head up to Australia’s Nature Coast! While you’re on the Sunshine Coast, you’ll experience Steve Irwin’s amazing Australia Zoo, explore the Noosa Everglades, take on the Great Beach Drive in a 4WD among many other experiences! On the Fraser Coast, you’ll visit Hervey Bay where there’s the chance you might spot a whale, you’ll visit the famous Fraser Island, and will also experience the naturally abundant island of Lady Elliot Island! This trip is too good to miss out on – sign up to log your bookings today! • Book a Malaysia Airlines flight into Brisbane and you’ll score 15 points! • Book any accommodation and ground product on Australia’s Nature Coast, you’ll get 10 points. • The more you book, the more points you’ll get…and the better your chances of winning a place on the fam trip! There’s 25 goodie bags for the runners up too! Sign up to log your bookings now! Flying in Business suite affords customers the same privileges as in first-class at a more affordable rate. Malaysia Airlines fly into Brisbane 4 x per week. Malaysia Airlines plans to increase its frequency to Brisbane as bookings continue to pick up! Boasting the iconic Glass House Mountains, lush rainforests, inspiring creativity and breathtaking scenery, the Sunshine Coast Hinterland provides a back-to-nature experience. The only thing more refreshing than the water is the relaxed lifestyle on the Sunshine Coast. From cool coastal towns to hinterland hamlets, diversity in the region is abundant. Surf, yoga or simply enjoy the ambiance of coastal cafes as you sip your morning coffee…this place is for relaxing. The Great Beach Drive offers an off-road adventure like no other. Travel via four-wheel drive along kilometres of pristine sandy beaches from Noosa Northshore to Rainbow Beach and beyond, passing towering coastal sand cliffs, coloured sands and the tallest and most complex rainforest growing on sand in the world. Foodie lovers – listen up! Alfresco dining, paddock to plate and table to trawler dining experiences come as standard on the Sunshine Coast. World renowned chefs call this part of the world home, and whether you’re looking for a waterfront restaurant, award winning brewery or even a food festival on the beach – get ready to indulge your every sense. 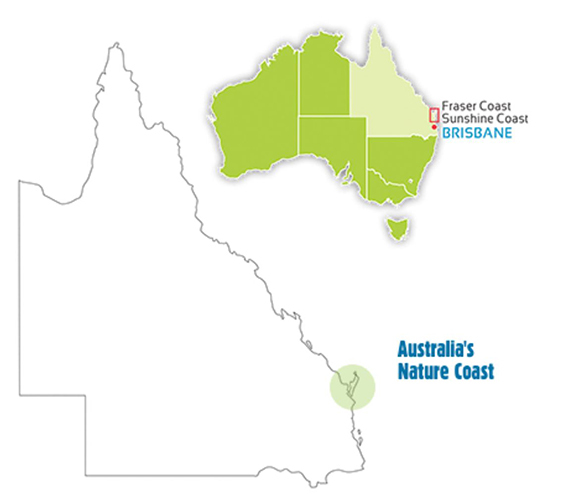 The Sunshine Coast is home to Queensland’s first UNESCO Biosphere Reserve and the Noosa Everglades, one of only two everglades eco-systems in the world and the Great Sandy Biosphere. Noosa National Park is home to sleepy koalas. Keep your eyes peeled for platypus in the Mary Valley too! Hervey Bay is the Whale watching Capital of the world! Get up close and personal with these magnificent giants of the ocean as they rest, play and teach their young in the calm waters of the bay. The adventurous can even swim with the whales. A couple of famous faces recently visited Fraser Island, known as K'gari – or paradise – by the local Butchulla people. You can visit the same spots they did including taking a dip in the sapphire waters of Lake McKenzie. Seek out the charming Maryborough which combines colonial history with a modern artistic vibe. Join a free walking tour or follow the mural trail. Visit the birthplace of Mary Poppins author P.L. Travers. Join a 4x4 tour of the world’s largest sand island and walk among towering rainforest trees growing out of sand, stroll beside the unbelievably clear and silent creeks that flow up from the underground water table and out to the ocean. The Fraser Coast offers one of the most diverse fisheries in Australia! From deep sea trolling and casting a line off the beach or jetty to lake and river fishing, there’s a species and a spot to suit every angler. Take a journey along Australia's Nature Coast in Queensland, Australia with a range of itineraries spanning across the regions that join the Sunshine Coast and Fraser Coast regions including World Heritage-listed Fraser Island. Whether you are looking for some off road action, foodie trails, wildlife encounters or the top fishing spots, Australia's Nature Coast has it all! Browse below and choose your next adventure. Taking in Hervey Bay, Lady Elliot Island, K’gari Fraser Island and Rainbow Beach, The Great Beach Drive itinerary provides a road trip like no other. Immerse yourself in the abundant nature of the Australia's Nature Coast region. From the awesome Glass House Mountains, to the wildlife of K’gari Fraser Island and beyond - prepare to be amazed. There’s a foodie encounter with every turn you take on Australia’s Nature Coast. Fresh, ripe fruits, trawler to table dining and delectable bush tucker are here for the tasting! Register for your chance to win a place on our exclusive Australia's Nature Coast fam trip!